Nothing tremendously exciting this week. Rows 4 & 5 for the Charm Pack Quilt Along - and 4 is done! Almost time to start piecing the back of that, too. The bottom is the back of the sailboat quilt. It be piratey. (Arrrr!) I'll probably frame the whole thing in the water from the front. 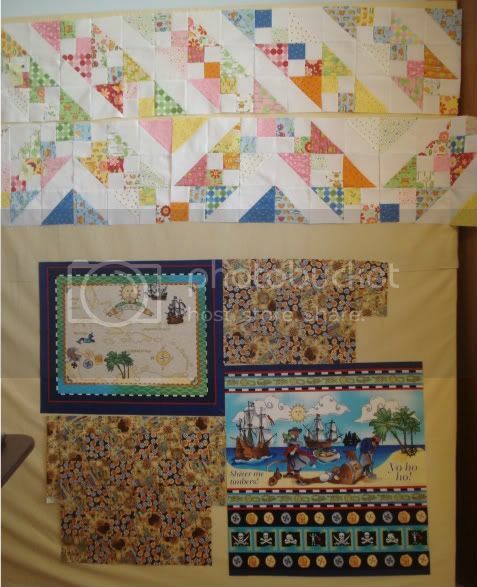 My goal for the week is to get both of these done and basted so I can pop the walking foot on and do some quilting by Friday. Check out everyone else's on Patchwork Times!